Static Mixers Provide Efficient Turbulent-Flow Mixing at Low Pressure Drop. OMEGA ® FMX7100 Series are designed for low viscosity applications. 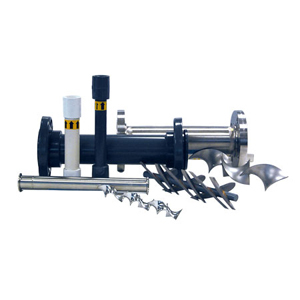 These mixing elements come 10 to a package and are injection moded in one operation to ensure lost cost with excellent quality. OMEGA ® FMX7200 Series mixers are designed for efficient turbulent-flow mixing at low pressure drop. Ideal for admixing water/wastewater treatment chemicals, polymer dilution, and other low-viscosity applications. Mixing elements consist of a series of polypropylene baffles, and are mounted in a PVC housing with FNPT ends. CPVC and clear PVC housings available. OMEGA ® FMX8100 Series plastic spiral elements were developed for adhesive and sealant and other high viscosity mixing applications. The FMX8100 Series comes ten to a package and the mixers are "knife edged" so that the unit flushes clean with less solvent. OMEGA ®FMX8200 Series come 10 to a package and are disposable mixers ideal for adhesives or other high viscosity applications. Like the FMX8100 the 8200 Series mixers are "knife edged" so that the unit flushes clean with less solvent. OMEGA ® FMX8400 Series mixers offer efficient mixing of low or high viscosity fluids at low pressure drop. Also ideal for two-phase (gas-liquid) mixing and blending of gases. Elements consist of a series of left and right helixes fabricated from 316SS. 304SS housing is corrosion-resistant, designed for high pressure and high temperature service. MNPT ends ensure easy installation. OMEGA ® FMX9600 Series spiral mixers are designed for high-pressure applications such as two component adhesives and sealants. The mixers consist of a series of left and right hand spiral elements which have been "edge-sealed" into a tube. OMEGA ® PVC and CPVC mixers, and OMEGA all stainless and carbon steel mixers, are designed for higher flow rates and installations involving 2½ to 18½ diameter piping systems. Many standard models provide complete turbulent flow mixing at low pressure drop. Housing ends are 150# flanges. Special configurations to your specifications available.